When Country Doesn’t Love You Back—Then What? CHICAGO, IL (October 21, 2016) – At this historical moment, with the world on the road and the stranger at our door, we must consider how to extend hospitality, as has been the call to God’s people throughout all of scripture. But hospitality camps at the tension-point of embracing Otherness and keeping one’s own “home.” It requires a durable, receptive, and flexible imagination. So how to develop the imagination for a time such as this? C. S. Lewis said literature can “enlarge our being” by “admitting us to experiences not our own.” The same could be said for cinema, particularly international cinema. Many people fear or hesitate from engaging with “foreign” film because it is so unfamiliar to our way of thinking. Cultivating that flexible imagination requisite to accepting otherness begins, says Lewis, with an especially Christian mode of artistic engagement: setting ourselves aside so we don’t just impose what we already know. In do so we learn to receive Otherness. That is why I love events such as the 2016 Chicago International Film Festival, where more than 125 films were shown over the course of a week. Following are brief reviews of several films that can expand the imagination and just might help you welcome the Other. In “24 Weeks,” a film by German director Anne Zohra Berrached, A popular young comedienne, Astrid, makes jokes about her pregnancy. Then her unborn child is diagnosed with Down’s Syndrome. With her boyfriend, Markus, Astrid’s response is inspirationally welcoming as the couple determines to have, raise, and love the child. Family and friends present a best-case scenario, and the scene of their visit to Down’s kids at their school is beautiful. If the film had ridden that wave, it could have become a feel-good classic. Instead, things get worse, and everyone confronts hard, hard choices. The genre here might be classed a “disease melodrama” or “medical procedural,” but the big tension is whether the film will fall from a powerful human drama to ideological propaganda. Certainly this film will provoke in discussions afterwards the heated debate it does on screen. This is an unbearably difficult film, and not for everybody but following it to the end will be a truly transformative, enlightening experience for many. Roaring off into a hipster mix of “Crash,” “Trainspotting” and “Casablanca,” “Amerika Square” is a driving, percussive, moral cross-examination of crazy border-crossing times. I rooted for it, as we cruised the migrant underworld, that black-market in bodies, fueled by sweaty desperation and cold-hearted greed. Multiple plot lines and narrators twist relentlessly together across Germany, Greece, and the United Kingdom. The refugee and his daughter. The tattoo artist as a 21st century Humphrey Bogart rejoining the fight. The puffy hater who strikes out against a changing world. We feel the pain of so many vulnerable people forced at a moment’s notice to trust their lives and families to strangers. All that momentum shoots into the third act, where the film wipes out and spins into a pat ending that either ties up too-neatly the loose ends or just plain forgets them. This is unfortunate, because these really are crazy border-crossing times. We really do have to learn to live in a multicultural twilight zone and decide which of these characters’ choices we might make. A popular movie that leaned into a dead-real but progressive vision would be so helpful right about now. And perhaps this one represents good faith effort to denounce the right things – greed, exploitation, prejudice, power, selfishness. Yet such a slick style can smuggle its own baggage, stereotyping persons and manipulating morals and plot. It doesn’t help that the punchline allows us to feel superior to the bigot – which seems part of the problem, not the solution. It’s hard not to feel this film isn’t just one more commodification of human flesh. “Fire at Sea,” which was a prize-winner at the Berlin Film Festival, is an Italian unconventional documentary set on Lampedusa, a tiny island south of Sicily to which tens of thousands of African refugees have fled, many of whom have died making the journey. We hear disembodied voices converse, in polite officialese – “How many people?” – and horrific desperation – “Please, we beg you.” Then silence, a virtual 911 record of tragedy. Italian coastal forces sweep in with helicopters, ships, radar, but these are no match for that endless, rolling dark sea. Meanwhile, Samuele carves a slingshot, amid a blissful childhood on the island, spared not just these horrors but the hard life of generations of fishermen. Samuele’s Aunt Maria cooks pasta, while listening to traditional Italian music, amid news of terrible casualties from another sunken refugee ship. The islanders’ close-knit world is intercut with an ongoing crisis. In a riveting scene, a kindly Italian doctor explains the class system on boats, which is determined according to payment. The lower-class in the hold suffer the most casualties. For these, this weary man has risked his very soul to treat as needed. He speaks into the camera, sounding like Dr. Rieux fighting The Plague: “It’s the duty of every human being to help these people.” We hear from refugees in short interviews, including a powerful Nigerian story-song of fleeing one inhospitable place after another, people dying all along the way. “Life itself is a risk,” the singer concludes. In “After the Storm,” a Japanese film directed by Kore-eda Hirokazu, characters are haunted by regrets of life not going as you’d hoped, urging us to find joy where we can. The film is a touch heavy-handed, but there are so many small joys. A broken family comes together during a typhoon, confronting their brokenness and finds that accepting it offers the closest thing to closure. The mother-daughter relationship is so winsome and snappy, one wants to spend the film with them. But as more than one character says, when there seems to be more storms this year than usual – and there’s always another one coming. 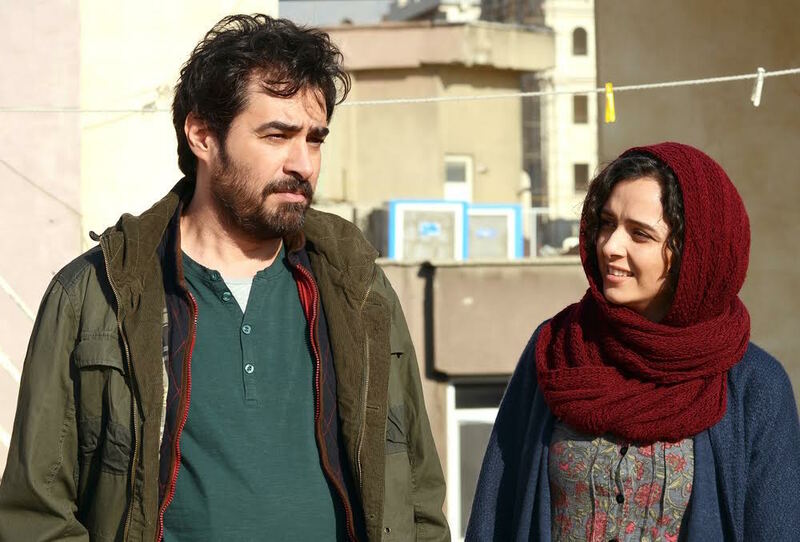 “The Salesman” is the latest film by Iranian director Asghar Farhadi, who won the 2011 Oscar for Best Foreign Film in 2011. By day, Emad teaches high school literature, including the classic Iranian tale, “The Cow,” whose film version he screens for students. By night, Emad plays the lead in a production of “Death of a Salesman,” a classic American tale. The two literary sources interact with the film, which intercuts scenes from the play on stage and movie on screen. Both sources depict a breakdown of ideals into madness, a grasping after illusions of lost greatness. The screenplay won the top prize at Cannes but will challenge those unfamiliar with the sources. The metaphor may be even bigger than Iran, for a question hovering on the edges of this multi-sourced script is what happens when two self-destructing trajectories – an honor-culture and a culture with its own recurring dreams of being “great again” – collide? At the 2016 Cannes, “Graduation” won Best Director for Romanian Cristian Mungiu. In the film, young Eliza has all but won a scholarship to Cambridge, just short her final exams, but her path forward becomes stalled after she is sexually assaulted – “Not raped,” her surgeon father Romeo always corrects. This may be technically true, but he is blinded by his relentless pushing of Eliza away from the small town that he couldn’t escape in order to validate his own lonely exile there. If this film is “about” anything it is about cheating: Romeo cheats on his wife, and everybody cheats everybody else, trading backroom favors, clogging the system with inequity and moral debt. “People should help each other,” somebody says, and they do, though “help” is relative. And that’s the problem – trying to discover right and wrong in the scarred landscape of a most brutal totalitarian period that has entangled the whole society in long-institutionalized corruption. “The Swedish Theory of Love” is a documentary from Sweden that argues the social and government-sponsored drive to emancipate everybody from everybody in early 1970s Sweden was a bad idea. The argument often takes the form of narration or talking heads telling us just this. Certain images seem more compelling: The popular weekend activity of searching the woods for Missing Persons. The agencies that enter apartments to find dead people forgotten for years at a time, sifting possessions for clues of connection to anyone. The sperm bank, where women abstractly peruse online catalogs of donors, cut with donors’ faces as they, er, donate. Such isolation is also contrasted with another kind of love, of a Swedish doctor who has moved to Africa to work in a clinic under conditions far less than utopian. Meanwhile, we meet postmodern hippies seeking togetherness in their own utopian way. These trails are interesting, but focus is lost by mixing topics – individualism, economics, immigrants, race – and leaving it to the talking heads to pull it together. Distinctions also go unmade between social safety nets and “social engineering.” Not making those distinctions has been a traditional rhetorical strategy of radical critics of any state effort to address structural inequity. Despite the blurred focus, the conversation here obviously is most pressing and thrown into sharp relief in the current Swedish context. 01/21/2017 When Country Doesn’t Love You Back—Then What? Share on Twitter Twitter Icon Share on Facebook Facebook Icon Share via Email email Created with Sketch. © 2016 – 2019 Covenant Companion. All Rights Reserved. Facebook Facebook Icon Twitter Twitter Icon Instagram instagram Created with Sketch.